I believe the universities (especially BU) use transit-style buses for their internal services. Would have made more sense to lease those. BU only has something like 6-8 buses. They should have at least mandated two entry/exit doors. On that note, anyone know why nearly all European coach buses have rear doors? Then they would have got no responses. The bid issued preferred low-floor transit but allowed high-floor over-the-road coaches. Peter Pan was the only bidder. No private company has 35 extra transit buses just sitting around waiting for a two-week shuttle contract. Peter Pan is one of the few that has that many spare over-the-road coaches that they can make available. So is Paul Revere not providing any of the service? 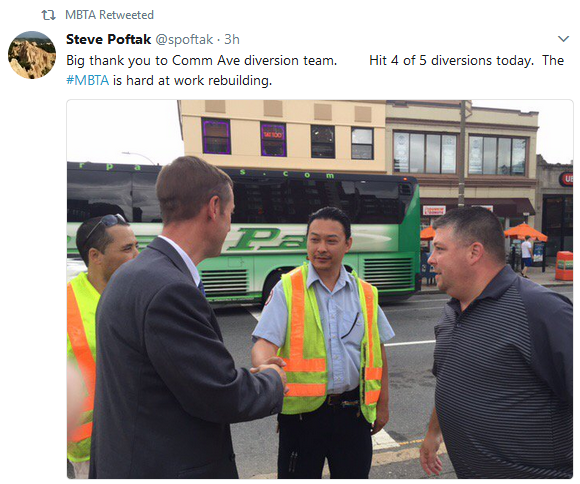 Some of the T's tweets had Paul Revere transit-style buses in the background. Comm Ave is just Peter Pan with over-the-road coaches. Newburyport/Rockport is primarily Yankee Lines with some other sub-contractors on weekdays, but all over-the-road coach. I don't think Paul Revere is interested in bidding on any job that would take work away from 589. I forgot that Paul Revere is doing the weekend Boston Landing-Reservoir shuttle for the Worcester Line diversion around the Comm Ave work. But that only uses a small number of buses. Stupid question. What does "Hit 4 of 5 diversions" mean? They were running five diversions and he went to visit four of them to see how things were going. The side of the Peter Pan buses read "Owned by the Commonwealth of Massachusetts / Operated by Peter Pan Bus Lines"
I also noticed "massDOT BUS+" decals on the buses. So, being entirely naive about this sort of thing, my natural response was WTF?, and I had to look it up. It also explains why these coaches have a wheelchair row with a separate side-door (not used unless requested by a passenger) at mid-length along the coach. The buses appear to be a mix of those owned by the state and owned by PP. Last edited by bigpicture7; 08-07-2017 at 08:01 AM. According to the latest statistics, it has been reported on the news last night that the program is running ahead of schedule. 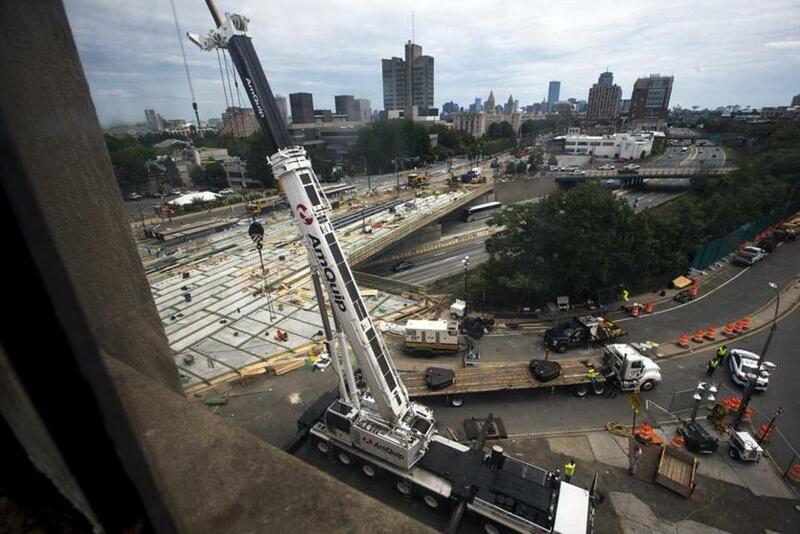 The installation of the main beams apparently went much faster than anticipated, which in turn allowed for the early removal of that large crane that had been parked on the Pike. My guess is that it went exactly how quickly they anticipated it going, but gave themselves a very long buffer, 'just in case'. Fair guess. I'd have done that, in their place. 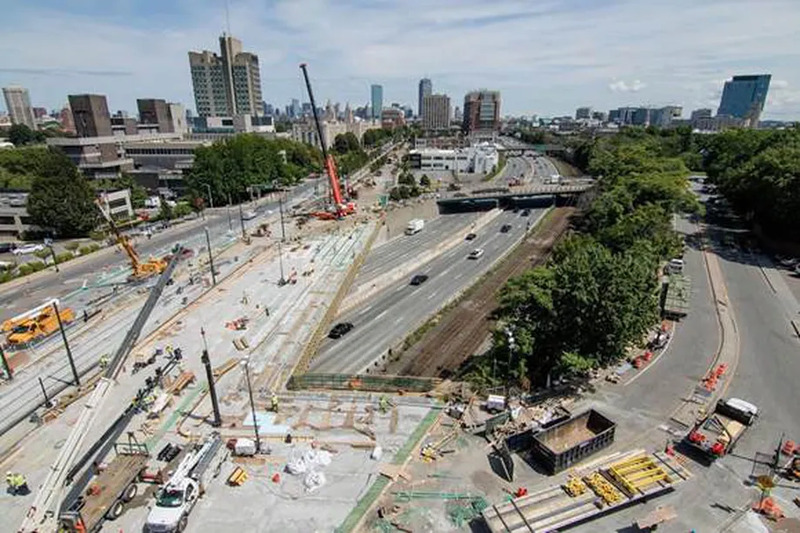 But three weeks shaved off the Pike closure time, as a percentage of the original number of weeks predicted to be closed, suggests to me that just about every single thing that needed to go right, did go right. And I would assume not only by chance, but by good planning: one of those cases where a group manages to swing "luck" their way via attention to detail. So if they take a victory lap on this aspect of the project, I'd applaud it. They still have all the rest of it to get done. I'd love to see them get the B line back in action ahead of schedule. Not because I ride it (I only rarely do), but because it'd be yet more signs of organizational progress at DOT. We need whatever good news we can get. Thats how NJ operates. The state buys everybody buses and the private carriers operate them. Went by there 3 weeks ago for the first time. Looks nice!! No more crumbling concrete debris! Last edited by Jahvon09; 07-23-2018 at 01:13 PM. Looks like a lot of work! !